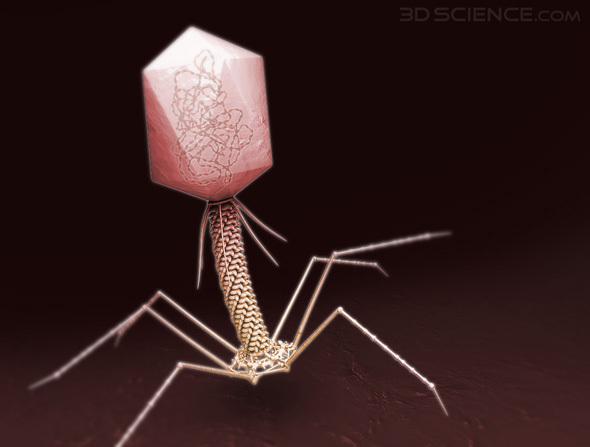 T4 Bacteriophage is a virus that specializes in infecting bacteria such as E. Coli, it measures about 225 nm high with a base diameter of about 50 nm. Though sinister and spider-like in appearance, T4 is nonmotile and only randomly comes into contact with the bacterium it infects. The leg-like tail fibers assist binding to complimentary protein receptor proteins on the bacterial membrane. T4 then releases a protein (Lysozyme) which assists in weakening the bacterium’s protective cell wall. The T4 DNA is injected into the bacterium as the tail sheath contracts, thrusting a hollow tube through the cell wall like a hypodermic needle. Once inside the Bacterium, the T4 DNA either (1) is integrated into the Bacterium’s DNA and replicated as the cell goes through cell division – resulting in more daughter cells with dormant viral DNA, or (2) is immediately used to synthesize components used in assembling roughly 200 new virions which are released into surrounding environment as the bacterial walls completely degenerate. T4 is comprised of a base, tail, tail sheath, icosahedral capsid containing DNA, and tail fibers – each grouped separately for easy animation and application of materials or textures. The Zygote T4 Bacteriophage model is available in low resolution for scenes with larger numbers of viruses, high resolution for closer renders, and a high resolution model in a posed configuration.